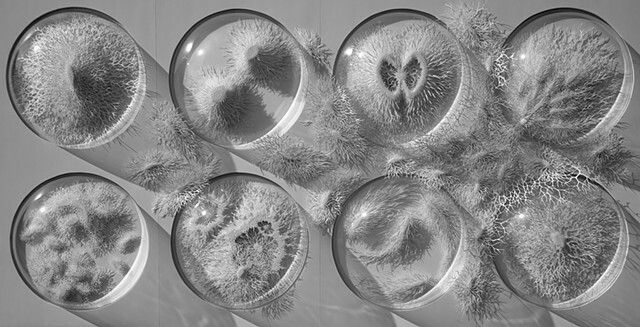 Familiar and other at one and the same time the sculptures make multiple visual references: cell structures, microbes, pathogens, vegetal forms, coral, fossils, insects, shells, the body’s organs and orifices, geological structures, topographical maps, cloud formations, cut away models, petri dishes etc…By mixing science and art, observation and imagination, I hope to find a bridge between the two, mimicking the breathtaking detail and complexity that exists at every level of scale in nature and filtering it through the eccentricity of the individual imagination. A recurrent theme in my work is the limitations of science when confronted by the vast scale and complexity of nature, science's goal of containing and defining nature is constantly subverted and fractured by the sheer volume and variety of data that needs to be observed, analysed and classified. This is reflected in the excessive detail that characterizes my work which overwhelms the eye by its sheer scale and volume. Process and material are crucial; the large hand cut pieces are dissected from sheet after sheet of paper in careful scientific fashion with a scalpel knife, sometimes taking months to complete, the slow act of cutting repeating the long time-based processes that dominate nature: growth, decay and re-growth. Paper, my chosen material, embodies the paradoxical qualities that we see in nature: its fragility and durability, its strength and delicacy; there is a pleasing poetic symmetry in taking this material that was cut from the forest and by cutting and transforming it once again returning it to its origins.